The Holst Birthplace Museum, in Cheltenham, hosted the recent exhibition of Theodor's work to celebrate the 200th anniversary of his birth on 3 September 2010. It ran until 11 December and included several of his best and most significant paintings as well as those that have emerged since his first exhibition in 1994. The large and attractive portrait of Jessy Harcourt (sister of Holst's patron John Rolls) came to light recently as did a dramatic romantic scene, Caesarini and the Soldier in the Forest, from Bulwer-Lytton's novel Alice, or, The Mysteries along with an engraving after it published in an American edition. With his discovery of this print, the Fuseli scholar Professor David Weinglass happily identified the subject of the painting which had hitherto proved difficult to pin down - there are very few readers of Lytton's novels these days! Many newly discovered and unpublished works and letters were on show at the exhibition which provided an excellent opportunity to update information and provide further material for a fuller account of the artist's standing in relation to both his own family and his influence on the Pre-Raphaelite circle. In 1845 the editor of the Art Union journal, Samuel Carter Hall, had pronounced Holst and his painting of The Raising of Jairus's Daughter as being "in advance of his age" and a harbinger of "- a day that shall witness the revival of the Arts in Great Britain." Rossetti would have seen and certainly agreed with this but pinned his colours to the mast by idolising Holst's more pagan offering of The Wish painted at the same time. Three years later he realised such a direction in public exhibition would preclude him from the success he craved. The result was his exhibition debut of The Girlhood of Mary Virgin, a self-declared turning from "the class of pictures which has my natural preference" to join the ghost of Holst in reluctantly and temporarily responding to the demands of "the market". History shows that this did not last long. There has been much academic and media interest in the life and work of the PRB in recent years and this is set to continue until at least 2012 when Tate Britain plan to build on their own ground-breaking show of 1984 with another Pre-Raphaelite feast. Significantly, this time, Holst is to be included in more than just a byline or two of the catalogue. Holst's finest and most succesful painting, The Bride (featured in the poster above), is to be shown and so provide the most appropriate example of the link of influence to the PRB described by Dante Gabriel Rossetti (coincidentally his other favourite Holst painting , The Wish, will be shown simultaneously in the Bohemes exhibition touring Paris. Madrid and Budapest). The link from Fuseli and Blake was demonstrated in the Tate's 2006 Gothic Nightmares exhibition and so, six years later, with The Bride sharing wallspace with the PRB, the public demonstration of Holst's linking role will be complete and show why Rossetti was such an admirer. An interesting challenge for Rossetti specialists took the form of a small watercolour sketch (cat.55) of Holst's The Bride tipped in to one of his sculptor friend Alexander Munro's notebooks. This had been mislaid for many years until just after publication of the catalogue in which the mystery watercolour was attributed to 'Pre-Raphaelite circle'. With its rediscovery halfway through the run of the exhibition the author of this mysterious Bride proved to be none other than DGR himself after comparison with other sketches by him in the book and elsewhere in Munro's collection. Munro was a close friend of Rossetti and his collection included a large cache of his early drawings as well as the only known Holst sketchbook, reported by Arthur Hughes to be from Rossetti's own collection, which was also on show. The Holst Birthplace Museum Trustees, Volunteers and Sponsors are to be congratulated for having provided the resources to present an exhibition and catalogue of international standard in this most appropriate and delightful Victorian setting. The fully illustrated catalogue is available from the museum shop and copies can also be obtained from Thomas Heneage Art Books in London (artbooks@heneage.com). 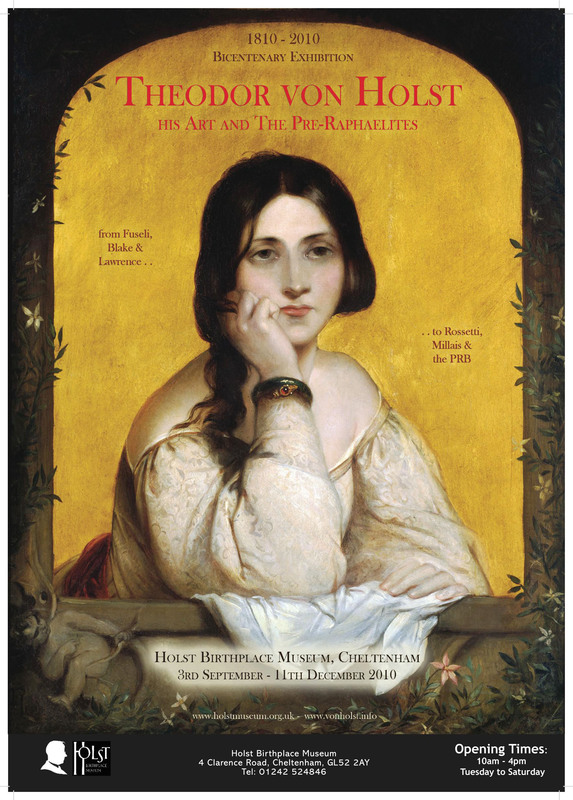 The British Art Journal (Volume XI no.2, Feb 2011) published an excellent exhibition review by Simon Po�� (pp.100-101) and a following issue contained an article by Max Browne on New evidence of Rossetti's admiration for von Holst which discusses Rossetti's ownership of the 'Rossetti-Munro Holst sketchbook', his watercolour copy of Holst's The Bride and a speculation on their relationship had Holst not died prematurely before the formation of the Pre-Raphaelite Brotherhood.